Norbert Szecsi won his first career World Series of Poker bracelet in Event #42 last night. A total of 2100 players entered into the tournament and several big names made it to the final day, but none of them were able to defeat the Hungarian player. Once the final table started last night the action started to pick up quickly and it never stopped. The final table lasted for just 132 hands and the entire final table was completed in less than five hours, which is the shortest final table we’ve seen this year. Szecsi was hitting everything on the final table. In one of the big pots on the final table Szecsi pushed all-in UTG with pocket 9’s, but Kirby Martin quickly raised all-in over the top with pocket aces. Szecsi ended up doubling up after hitting two nines (quads). Shortly after that hand Martin moved all-in on the turn with a pair of aces. Szecsi called with a flush draw and he hit his flush on the river to eliminate Martin in 4th place. After knocking out Martin, Szecsi had over half of the chips on the table. Chris DeMaci was the next to be eliminated from the tournament. 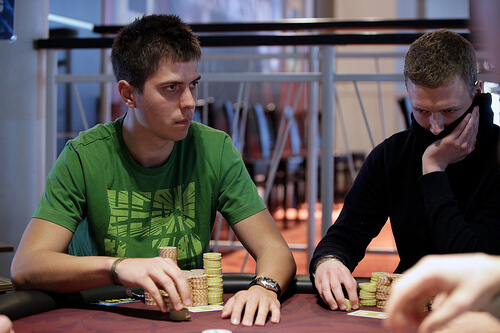 Heads-up play between Szecsi and Denis Gnidash only lasted seven hands. On the final hand Szecsi had A/10 and hit two pair on the flop. DeMaci had A/Q, but was unable to hit a queen.